Album Review: The Xcerts - Hold On To Your Heart - GENRE IS DEAD! 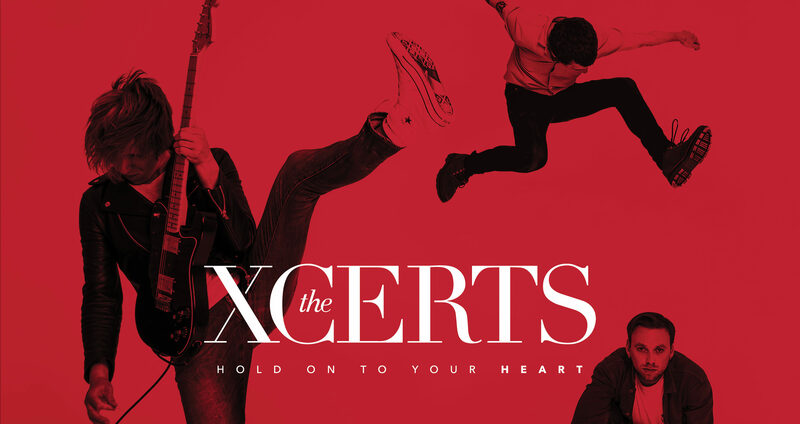 After the release of their successful third album There Is Only You in 2014, the expectations were high of what British three-piece The Xcerts were going to come up with next. Between touring with the likes of Twin Atlantic, Biffy Clyro and most recently Nothing But Thieves, the Brighton-based Scots have been writing new music to fill a record with new rock tracks. The first single of the album Hold On To Your Heart (released on 19 January 2018 through Raygun Records), ‘Feels Like Falling In Love’, was received widely with great enthusiasm after its release in the summer of 2017, setting the anticipation for the album even higher. With such a great first single, what could we be expecting from this enigmatic trio that stands out with their 80’s inspired poprock songs? It needs to be said – The Xcerts have always had a very special place in my little chilly heart. After their 2009 debut record In the Cold Wind We Smile, it’s been great seeing the band grow from a small British underrated band with great potential to an established name in the UK rock scene with a plethora of critically acclaimed records under their belt. The band has grown an awful lot musically over the years; starting with taking small indie-rock steps on In the Cold Wind We Smile, to their rougher, almost grunge-inspired second album Scatterbrain, to their cheerful and Springsteen-esque sound on There is Only You and now continued on Hold On To Your Heart. The album starts off quietly with heartfelt track ‘The Dark’, which excellently describes the dark period that The Xcerts’ singer Murray Macleod was going through as the new album was in the process of being written. Hold On To Your Heart is about finding a pinhole of light in the dark and turning it into the sun. An intense break-up, a death in the family and the loss of a close friend of the band all contributed to the entering of a dark period in his life. ‘The songs are coming from a really bad place; I had become a really empty human being,’ Murray explains. ‘It felt like my wires were all lined up perfectly and colour co-ordinated and as soon as my girlfriend and I broke up, it was like someone had yanked them all out. I couldn’t relate to anyone, I was struggling to talk to people, I just couldn’t go out and face the world. Fundamentally I just felt completely worthless, I just didn’t know who I was and I didn’t really care about who I was either!’ The opening track hears Murray declare ‘Tell me when the worst is over’ in the chorus, describing how this dark period in his life has been. Albeit having a pretty negative theme, the song is actually hauntingly beautiful. It is not a very usual pick for an album opener; whereas the most albums try to kick off the album with something powerful, ‘The Dark’ is a more introvert, piano-driven tune. But Hold On To Your Heart is not a normal record; instead it is an album that tells a story of hope. The beginning might be dark, but better days are coming and the sun will shine again. The timeless sound described by the three-piece, completed by bassist Jordan Smith and drummer Tom Heron, is vividly present in every single track on the album. If this album was to be put in a time capsule and dug up in a few decades, I am pretty sure it would still be appreciated by the musical fans of that era. Two prime examples of this typical, modern yet classic sound can be heard on ‘Drive Me Wild’, characterised by saxophones (I mean what modern rock band still uses saxophones? Ten points to me! ), and ‘We Are Gonna Live’. ‘Drive Me Wild’ was very recently announced as the band’s next promotional single in support of Hold On To Your Heart. And finally; every Xcerts album has its emotional power ballad, to which I often refer as ‘the cry song’. Well, it turns out that the Scots were one step ahead of me and called their almost mandatory emo-track ‘Cry’. Another reference to the hard times that the band have experiences over the last years, the song seems to be an apology to whomever has been made crying. The song is so incredibly full of raw unfiltered emotion and honesty that it is almost impossible to not cry when listening. All the darkness that has passed in the band’s lives over the last years seems to be mentioned. The line ‘we need death to truly feel alive’ might refer to the death of Murray’s grandmother, or the death of the band’s mutual friend Tom Searle (of the band Architects), with whom the band were really close and died of cancer in the summer of 2016. Whether this is an apology to Murray’s ex-girlfriend, his family, his bandmates or even to himself, it sure strikes a very emotional chord. And so the album comes to an end. What started as an album with the promise of hope and better days, turned out to be an absolute whirlwind that takes the listener from looking back and learning from negative experiences to looking forward to and creating new positive ones. But that’s just how life itself is too, and that is what make this album so incredible: the ups and downs of life are probably the most timeless subject matter possible. To be told from Murray’s personal perspective and to be put in the successful musical formula of The Xcerts, Hold On To Your Heart might be one of the best albums to have been released this decade. The Xcerts are embarking on a big UK tour in February and March. Tickets and dates can be found on their website!